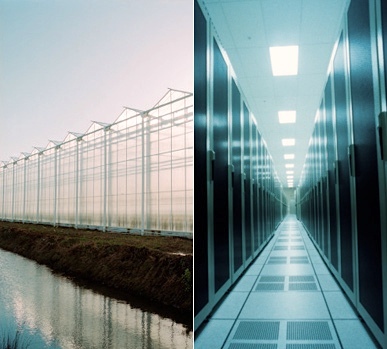 The combined heat and power generation of modern greenhouses supply the electrical energy for large high-performance datacentres. The exhaust heat of the computer equipment is delivered back to the greenhouses. Data centres account for roughly 1% of the global electricity consumption. And the demand for new data centres keeps growing as more and more services are moving to the cloud. Companies work hard to increase the efficiency of their facilities. Electricity is not only used to run the ict equipment, but also for lighting and most important for cooling. 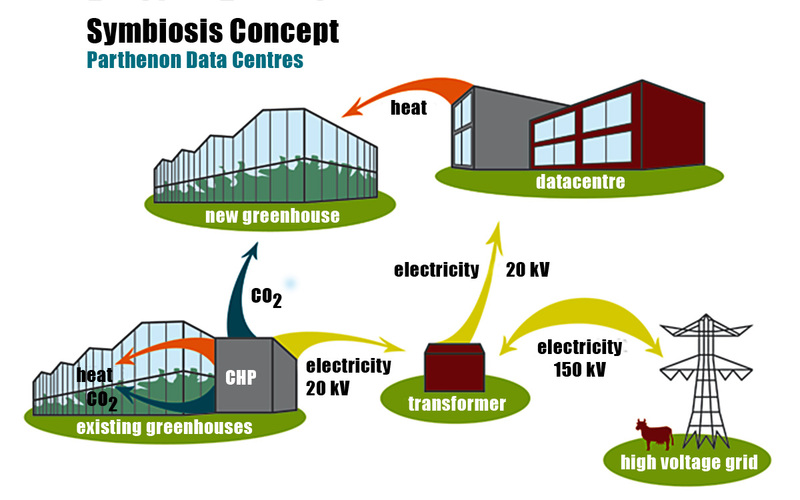 Parthenon Data Centres developed a project to combine a data centre with an industrial scale greenhouse. These greenhouses usually generate electricity with combined heat- power units (CHP). The heat and the CO2 from the combustion process of the gas engines is pumped into the greenhouses to speed up the growth of the crops. The electricity produced is no longer sold to the grid, but locally fed in the data centre. 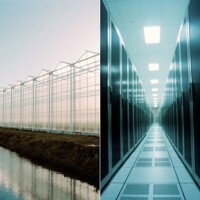 The data centre, on the other hand, supplies its superfluous heat to a newly built greenhouse. That greenhouse receives its share of the CO2 from the CHP units. During summer when outside temperatures are suitable for the crops and therefore no additional heating is necessary, the heat is stored in an aquifer underground and can be extracted again in the cold season. One of the first examples of reusing waste heat from a data centres was deployed at the Worcester Polytechnic Institute, Massachusetts, USA in 1986. The heat from the computer room was vented to a space just below a tiled sidewalk. During winter that kept the sidewalk free of ice and snow. Since then, several examples of heat reuse have been implemented. Most common is to supply the heating systems of residential- and office buildings. In April 2012 Parthenon had to admit that the project was on hold. Only four days later, Datahouse, a local data service provider made public that he was interested in the project and that negotiations are underway.